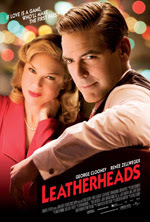 Leatherheads is not just a sports movie. It is a romantic comedy which harkens back to classic Tracy-Hepburn movies. Looking at the eyes of Zellweger and Clooney will show you that mischief and mayhem are afoot. The photos and lighting in tese posters are stunning. This film is a 1st class operation all the way.